You’ve heard the expression “choose your battles” we have to consciously do that but sometimes our battles choose us, sometimes God has us enter into them. Some of life’s conflicts become a death defying fight of faith. When God calls us into a season of difficulty, the trues which we had been learning of the character of God and His Word are to be appropriated to our circumstance. This applied knowledge will become powerfully alive as we trust and depend upon the Lord. So often we find that we really don’t believe the Bible as sincerely as we thought. We find ourselves doubting our beliefs and whether God can handle our troubles. This trying of our faith is valuable to God, it is more “precious than gold that perishes, though it is tested by fire, may be found to praise, honor, and glory at the revelation of Jesus Christ” (1Peter 1:7). Quarried nuggets of promise in The Book become very dear to us; as we cling to them in faith for outworking in our own life. During our times of trial the Spirit of Christ can raise wellsprings of living water from the implanted Word within our soul. We are refreshed and assured as we call to mind God’s faithfulness. By resourcing ourselves from our earlier victories and answered prayer we have a greater capacity to develop a steadfast spirit by resisting the devil and his accusations against the goodness of God. The Apostle Paul instructs us in 2 Corinthians 1:4 that the comfort we received through our hardships may in turn comfort and encourage another in the midst of their challenge; thereby we become refreshment to others. Just when we think we’ve got things figured out, God allows Satan to sift us as Jesus told Peter in Luke 22:32. Even this sifting is so that after we have gone through our trial we can “strengthen the brethren”. We will be able to strengthen others because we ourselves have become stronger in our inner man and stronger in the faith of God. The former doctrines we thought we had believed are tested and challenged and our minds become renewed to the mind of Christ. By patiently waiting and trusting God, we allow the Holy Spirit to teach us His way through our difficulty. Be confident that the Lord does this refining work within us to help us know Him intimately by changing us into His character and likeness. This transformation is the mystery of the Gospel “Christ in you, the hope of Glory” (Col 1:27). Our path may not appear to be the way we imagined our loving God would lead us, it seldom does. Our greatest example is Jesus who lived a humble life, he wasn’t the Messiah and King the religious Jews anticipated; they were said to have missed the time of their visitation (Lk 19:44). The Cross led to Christ’s triumphant victory; tearing down the middle wall of partition that separated us from the Father. God’s justice was satisfied through the shed blood of His Son who made the atoning sacrifice for the fall of mankind. Jesus Christ purchased peace with God for those who will believe in Him. The battle has been won; the devil is after our faith to rest in His provision. Let the peace of God rule in your hearts, to keep and protect you when you face adversity. 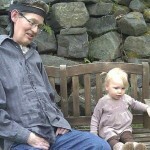 Although Scott fought a long standing battle against the slow progression of Lou Gehrig’s disease, he passed away unexpectedly returning home from a haircut. He was revived and given 6 more precious days with us before he went on to Paradise. I am confident that each of these days fulfilled both earthly and heavenly purposes, completing the number of days God had allotted to him. Despite being diagnosed with this terminal illness in 1997, with which the medical field has no cure, Scott always held on to hope. Rather, it was his invitation to go deeper and farther in his relationship with God. Scott looked to his Savior, Jesus the man of sorrows, who was acquainted with grief sent to redeem the world. Scott always had his eye on the purposes and call of God to allow him to walk his own path of bodily humiliation. The Holy Spirit quickened him with strength and determination in his inner man. Scott held to the belief that all things were for his sake although his understanding could not comprehend why. He held to and applied the promises in the Word of God as his ongoing prescription and The Great Physician gave him medicine for his soul. As the apostle Paul wrote “he who plows should plow in hope, and he who threshes in hope should be a partaker of his hope.” Those that knew Scott knew that he was a partaker of hope in Christ’s salvation for his circumstance and was a sharer of the Good News of eternal life. Scott was not beyond discouragement from the limitations and dependence imposed upon him through illness. He clung to God’s Word to deliver him from the projections that constantly tried to assail his mind day & night. He sought examples in the Word of God that exhibited total dependence upon the mercy of God. He often identified with the heart of the Psalmists, especially those of King David who encouraged himself in the Lord and said in Ps 56:3-4. In God I have put my trust; I will not fear. What can flesh do to me? 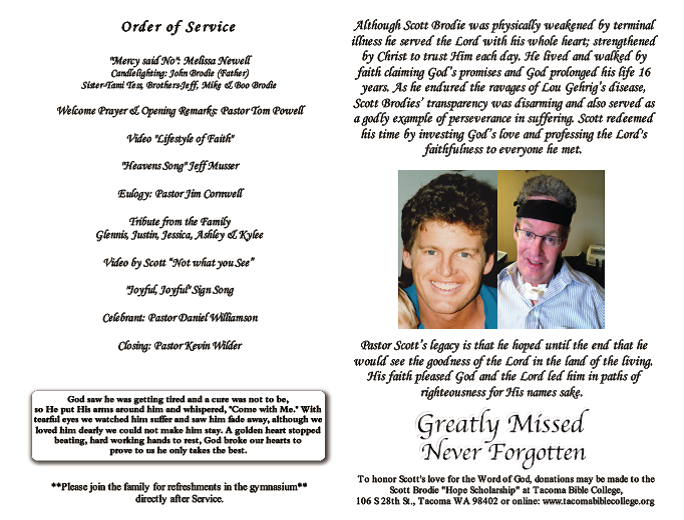 Two weeks before he died, Scott had been having low energy and suffered a fall. Although he wasn’t injured, his mind warred against him. He considered the prophet Elijah in 1 Kings 19. Elijah had run from Jezebel in fear into the wilderness and sat under a juniper tree. He asked God that he might die, saying “It is enough; now, O Lord, take away my life; for I am no better than my fathers”. At this time after Scott’s fall, in anguish of heart, Scott asked the Lord “Isn’t it enough?” It would have to be the Lord that took Scott’s life because again and again he determined that he would not resign to death, it would be to him as if quitting his race. Scott wanted to go the distance and finish well by allowing God’s to fulfill His purposes for his life. The scriptures tell us that Elijah was fed by an angel and went in the strength of that food forty days and nights to Mt. Horeb. He stayed in a cave; then the word of the Lord came to him, and asked “What are you doing here, Elijah?” Scott identified with this cave of despair; he allowed the voice of the Lord to ask him what was he doing there. Why was he tempted in hopelessness? Scott knew this was not the place for his soul to receive abundant life from the Spirit. He applied this word to himself and his circumstance, allowing the Lord to challenge him and impart strength to his heart. One of the last posts he made just days before he died was…. Little did we know his desire was to be fulfilled shortly after this posting. Scott’s greatest anchor throughout his illness was his encounter with the Lord months after diagnosis. In the communion he had with Jesus, he believed he would serve God in Arizona and that he was commissioned to give thousands and thousands of people hope. Scott’s vision was an anchor for him and it fueled him to go farther, to keep apprehending Christ. Scott had sensed something supernatural that was a mainstay for him; he went to Arizona a thousand times in his spirit not yet comprehending what it all meant. It was as if he was given a time release capsule that supplied an ample dosage to bolster his faith and energize his ministry for years. Scott’s desert land became a wellspring of hope for others. He feasted from the table God prepared for him and his soul was satisfied. I will miss Scott’s Godly leadership and companionship. We were bone of each others bone and flesh of each others flesh; two who had become One. 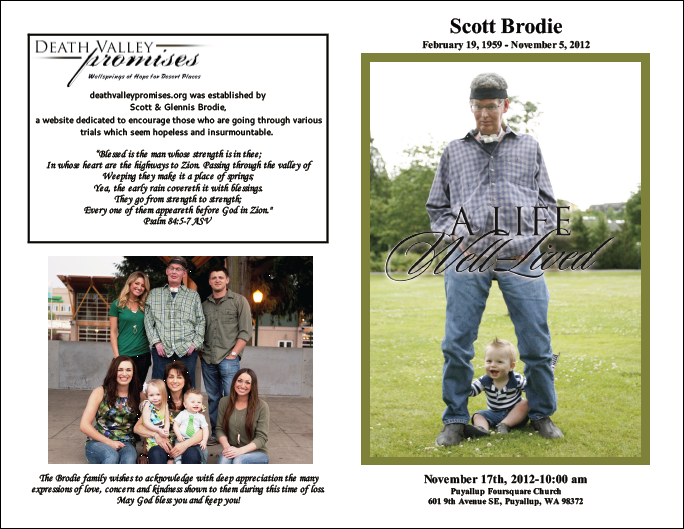 Scott Brodie (53 years) Richard “Scott” Brodie peacefully passed into eternity Nov 5th, 2012. 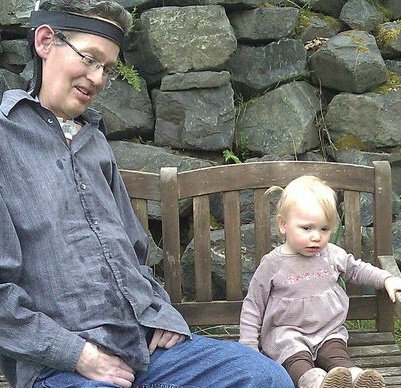 Scott died of a respiratory arrest as a result of his 16-year battle with ALS disease. 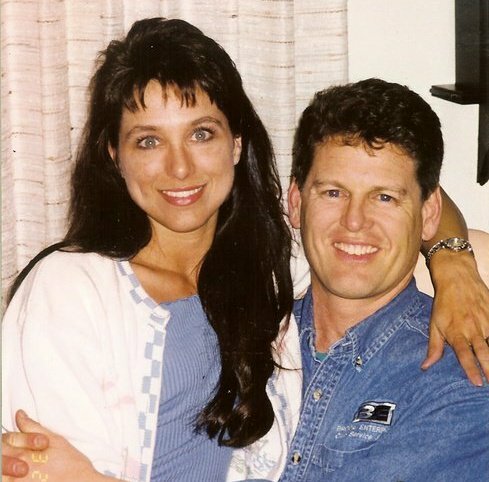 Born Feb 19th, 1959 in Iron Mountain, MI, the son of John and Mary Ellen Brodie, Scott was raised in Wisconsinand traveled to the Tacoma area in 1983, where he met his wife Glennis. 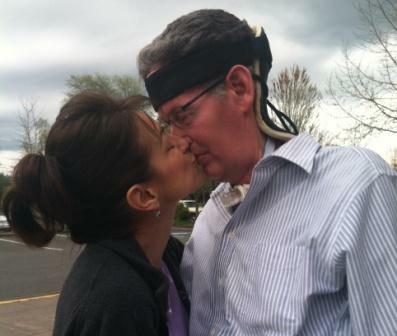 The couple spent 28 years of married life together and were residents of Puyallup, WA. 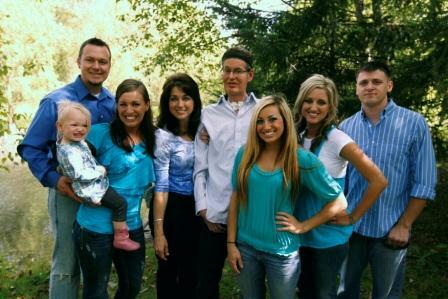 He is survived by his four children, Justin, Jessica, Ashley, and Kylee, and two grandchildren, Korbyn and Brodie. Memorial services will be held Saturday, Nov 17th, 10:00 am, at PuyallupFoursquareChurch, 601 9th Avenue SE, Puyallup, WA 98372. “… Though outwardly we are wasting away, yet inwardly we are being renewed day by day.” (2 Cor. 4:16, NIV). Saddled with Lou Gehrig’s disease, Scott Brodie is far removed from his days playing basketball, football, and softball. Long gone are health-club racquetball, working out, and coaching the church men’s and women’s softball teams. Today, he cannot fend for himself at all; he is incapable of independently eating, dressing, or bathing. Nor can he use his arms, but he can type with his toes and communicate a form of sign language with his feet. Even blinking is difficult, requiring the help of his wife, Glennis, who also serves as interpreter, since his voice is reduced to sounds unintelligible to anyone else. Such are the ravages of amyotrophic lateral sclerosis (ALS), which came to prominence when it killed New York Yankees great Lou Gehrig in 1941, a tragedy immortalized in the 1942 Gary Cooper movie, The Pride of the Yankees. Occurring in two of every 100,000 people, ALS is a degenerative disease that affects the brain’s ability to initiate and control muscle movement. No longer able to receive nourishment, muscles atrophy, eventually leading to death, according to the ALS Association. There is no cure. Though Brodie received the standard life expectancy of two to five years, he is now in his 16th year with ALS. That puts him among about 10 percent who survive more than 10 years. Just 5 percent make it to year 20. Yet, as Brodie helplessly watches his body waste away, he is beholding another phenomenon: His increasing reliance upon God and His Word has enlivened his spirit, taking him to greater spiritual heights. Born in Iron Mountain, Michigan, and raised in several Wisconsin towns, Brodie attended the University of Wisconsin and moved to San Diego in 1982, later working in a gym health bar selling organic food products. In 1983, he moved to Tacoma, Washington, to start a new health bar in a gym, and it was there that he met Glennis. 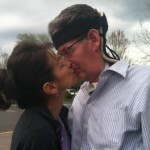 Both physically active, they frequently exercised together and fell in love, marrying in 1984. Leaving the health bar business, Brodie worked a variety of jobs until 1985, when he began learning mobile vinyl repair and auto pinstriping. He then got the idea to launch his own mobile upholstery company specializing in health clubs and restaurants. Brodie Upholstery began in 1986 and is still going today, based in Puyallup, Washington, with son Justin running field operations and Glennis managing the office. Brodie obtained a bachelor’s degree in theological studies in 1997 from Maryland Bible College & Seminary in Baltimore, which was affiliated with Greater Grace World Outreach. He taught Biblical studies in Tacoma at Greater Grace Bible College, where Glennis earned her degree in Biblical studies in 2003. Both remained active in ministry with Greater Grace, now known as Living Grace Ministries. They attended Greater Grace Church in Tacoma from 1988 to 2008, until Brodie’s health made it impossible to attend, so they now listen to daily messages online and host Bible studies in their home and an occasional speaker. With an active family of four children, full church involvement, and a growing business, life was good for the Brodies. Then in late 1995, Scott noticed twitching in his right index finger. Eventually, he became unable to press hard enough when writing invoices at work to create duplicates. He detected a loss of strength in his right arm, reducing his velocity when throwing a softball or football. Also, his aim when shooting baskets was off. Figuring he needed more strength training, he increased his exercise at the gym. Instead, he slowly worsened. The problem expanded to his left hand and left arm, then neck to chest. Brodie learned from his doctor it could be anything from a pinched nerve to ALS. Because his condition continued deteriorating, Brodie thought the worst, leading him to research ALS. That fall, a neurologist confirmed his fears after just two tests and a physical exam. Brodie, now 53, was 37 at the time. He refused to believe the neurologist, who delivered the diagnosis with clinical callousness, he says, simply stating the hard facts about ALS, offering no hope. When Brodie said God could heal him, the doctor accused him of “living in denial.” Yet, the diagnosis devastated him, leaving him and Glennis crying and praying together in the parking lot. Several other neurologists confirmed ALS, he says, all with the same clinical coldness, leaving him without hope that any doctor could help. So he turned to faith messages and God’s Word to remain encouraged. Satan continued waging an intense battle in his mind, with lingering projections of death and depression. The biggest hope-builder of all occurred in March 1998 during a visit to Arizona, when Jesus appeared to Brodie one night in either a vision or dream. He told Brodie his healing had already begun and asked three separate times where he would like to serve Him, and he answered Phoenix. Greatly encouraged, Brodie then sought alternative treatments for the next seven years in the United States, Canada, and during three trips to Mexico, spending thousands of dollars on a wide variety of therapies. After all, he had God’s promise he would be serving Him in Phoenix. While he and Glennis had faith and hope, at the same time they felt they couldn’t simply sit at home and do nothing. Perhaps God’s answer would come through people, they thought, so they had to seek alternative treatments since conventional medicine offered no hope. Each alternative built hope, but each failure became a hard hit. Yet they remained encouraged and hopeful, believing God for healing. Instead, Brodie’s condition worsened. He became so weak by 2005, he had difficulty breathing, talking, and could barely eat without choking. Realizing he needed intervention to save his life, he followed Glennis’ urging and got a feeding tube, bi-pap machine to help get air into his lungs, a custom neck brace, and a wheelchair. The following year, the healing Brodie began to see was spiritual, not physical, as God revealed that He could never fulfill His promise of physical healing if Brodie continued relying upon his human effort to seek a cure. Instead, all he had to do was choose to live and God would take care of the rest, healing him on this earth. And more trials he would surely endure, including a tracheostomy in April 2009 so he could use a ventilator, and a severe lung infection in June that led to choking because of an obstruction. Glennis had to clash with medical authorities in the emergency room to obtain the necessary antibiotics for her husband. Today, Brodie continues to use a ventilator, back brace, and wheelchair, though he can do some walking. Unable to eat or drink, he receives puréed food and vitamins through a feeding tube. Every couple hours he needs help to blink because his eyes are dry and unable to shut completely. His lungs function at just 20 percent capacity, so a lung infection becomes critical since he has such low breathing capability. 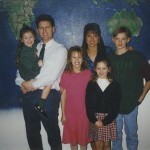 The Brodies’ children are Justin, 29; Jessica, 27; Ashley, 24; and Kylee, 21. 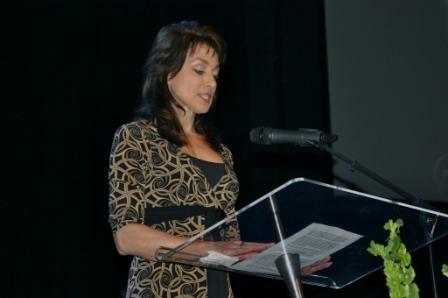 Jessica has given them two grandchildren: Korbyn, born December 2008, and Brodie, born July 2011. Ashley and Kylee still live at home in Puyallup and help with care, running errands, and maintaining the house. Jessica comes over four days a week to help with care and work in the family business. One of Brodie’s brothers, Boo, 50, lives in Tacoma and also helps Justin in the business. Brodie has two other caregivers to help Glennis with household chores. Glennis says that although the kids have lived with the uncertainty of their father’s condition, they have not allowed it to weigh them down and have pursued their futures with an enhanced view of the world, more alert to others with limitations. As Brodie continues to wait for deliverance from an impossible situation in the natural, he draws upon a host of relevant Bible passages, as well as the lives of Abraham, Daniel, Joseph, Nehemiah, and Hezekiah, who all faced waiting and adversity before receiving their answers. The Brodies know that God is accomplishing something special as they wait. Brodie says he is tempted to view his weakness as a liability that should be removed but realizes it may be his greatest asset because God is using it both to refine him and increase his dependence upon Him. For more on Scott Brodie’s journey of faith, check his blog at www.deathvalleypromises.org. Ashley talks about living a lifestyle of Faith with her dad, Scott Brodie.